The internet: What is it? You are back at the first page! 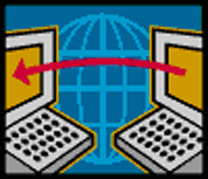 The internet consists of millions of PC`s, which are connected by cables and wires with each other all over the world. Information and data are exchanged between the PC´s. You can look at information, which is stored on another PC. All this information is written onto webpages. What you read here, also is a web page.